Thankfully, it turned out superbly. Cauliflower is so creamy when blended and a bit of extra texture from the beans and a lovely fragrance from the rosemary is all it needs. A perfect autumn meal, I was also lucky enough to have chunks of delicious homemade rye bread to dunk in. Surely the best part of soup? Melt the butter in a large saucepan and sweat the onions and rosemary for 5 minutes, or until the onions are softened. Meanwhile, chop the cauliflower into small florets and add them to the pan. Stir until well coated in the butter and fry for a couple of minutes. Pour over the stock and bring to the boil. Reduce the heat and simmer for 15 minutes, or until the cauliflower is completely soft. Remove the pan from the heat and blend the soup with s tick blender until smooth. Stir in the double cream and cannellini beans and warm through. Season with salt and pepper. 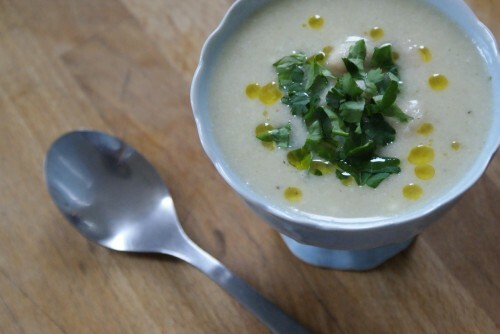 To serve, ladle the soup into bowls, drizzle with olive oil and sprinkle over the parsley.